PHOTOS ATTACHED: CAPTION INFORMATION IS LOCATED AT BOTTOM OF NEWS RELEASE. TOPEKA — National School Counseling Week, Feb. 4-8, focuses attention on the unique contribution professional school counselors provide to school districts across the state and country. The American School Counselor Association (ASCA) sponsors the week. National School Counseling Week also highlights the impact school counselors can have in helping students achieve school success and plan for a career. Gov. Laura Kelly on Friday, Feb. 1, signed a proclamation designating Feb. 4-8 as School Counseling Week in Kansas. More than 100,000 school counselors across the country, including 1,247 licensed public school counselors in Kansas, will be participating in the week’s festivities. The number of school counselors in Kansas has increased 6.4 percent (80 counselors) over the 2017-2018 school year total of 1,167, according to Kansas State Department of Education figures. The American School Counselor Association is a worldwide nonprofit organization based in Alexandria, Virginia. It was founded in 1952 and supports school counselors’ efforts to help students focus on academic, personal/social and career development. For more information on ASCA, visit www.schoolcounselor.org. The Kansas School Counselor Association (KSCA) has been an active organization since 1965. ASCA serves as the parent organization for the KSCA. For more information on the KSCA, visit www.kssca.com. For more information on school counseling in Kansas, visit https://www.ksde.org/Agency/Division-of-Learning-Services/Career-Standards-and-Assessment-Services/Content-Area-M-Z/School-Counseling. CAPTION: Gov. 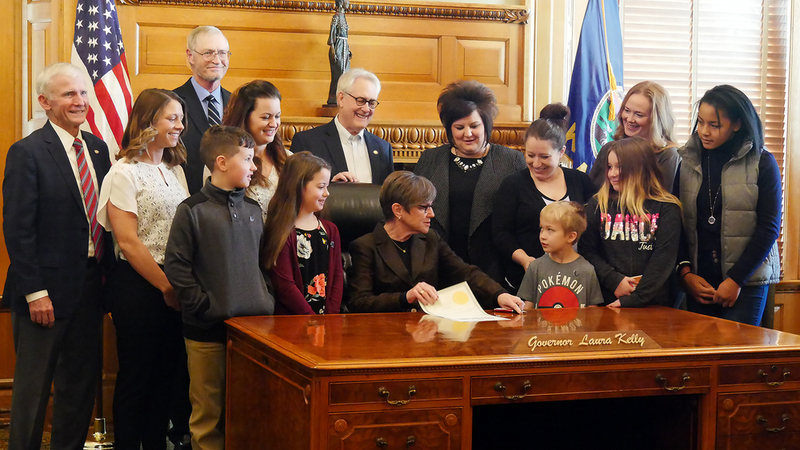 Laura Kelly on Friday, Feb. 1, 2019, signed a proclamation naming Feb. 4-8 as School Counseling Week in Kansas.